Guest Packages allow you to set up packages to include room and tax charges, restaurant charges, greens fees, tours, champagne and other items so that you can sell these packages while accounting for the revenue on the back end. Package setup allows several parameters such as charging per adult or child, charging once or nightly, printing each line separately or all charges on one line. For general package setup instructions see Guest Packages. When making a reservation or checking in a guest, you will select the package to apply to the guest. 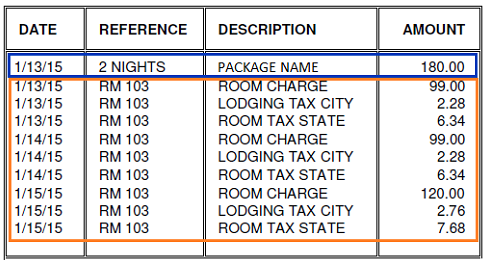 The charges post automatically when "Post Room and Tax" is run at night audit. Package charges may be posted manually in Post Folio. In the "code" field type "K" and press Enter. At the prompt enter the package code. At the next prompt enter the number of nights. For example, package charges total $150 per day and you enter 3 for number of nights, then you will have one posting for $450. If your guests sometimes stay longer than the package days, such as a guest staying five days with a 2-night package, this method of manually posting the package works well. You post the package once and you don't have to remember to go into the folio to the rate code from P to 2 during the stay. You will not include room charges (RC*) in the package unless it is a on-night package. This is because the package will post once but the room charges will post nightly at the rate assigned. For example, you might assign $99 per night for the package nights and then $120 for the remaining nights of the stay. 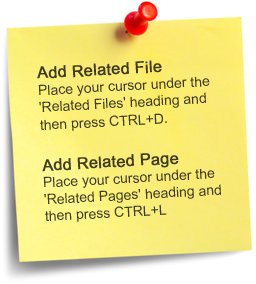 Create the package without RC* and RT* such as the example below. Check the guest in with the appropriate rate code, 1-5, rather than rate code P. In the Room Rates grid, enter the rates for the first package nights and the rates for the first non-package nights. All nights of the stay do not have to be entered. Enter the date that the rate should change and the rate it should change to. See example below, using Rate Code 2. After completing the check-in, go to Post Folio and enter the room number. In the Code field enter K and press Enter. At the Package Code prompt enter the package to post. Enter through the fields or click OK. You can do this posting right after you check in the guest or at any time prior to check-out. At the next prompt enter the number of days to calculate when posting the package charges. The prompt will display the guest's arrival and departure dates and the stay length. For example, if the guest is staying 5 nights and the package is for 2 nights, enter 2 at the prompt. 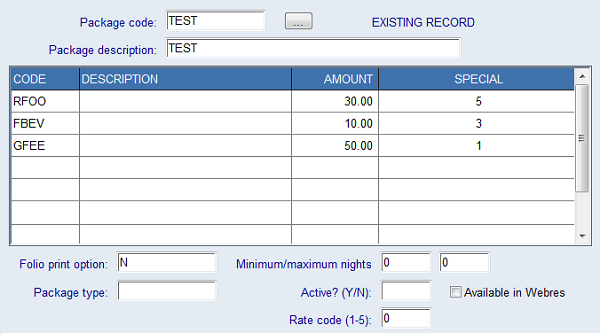 The system will calculate the amount to post based on the package price and the number of nights you enter. That's all you need to do. When "Post Room and Tax" is run from the Night Audit menu, the room and tax charges will post to the guest each night of the stay, at the rate applicable for each date. Below is the displayed folio showing all charges. Below is the printed folio. All package charges print as a sum on one line with the Package Description (if the package was set up to do this). The room and tax charges print for each night posted. 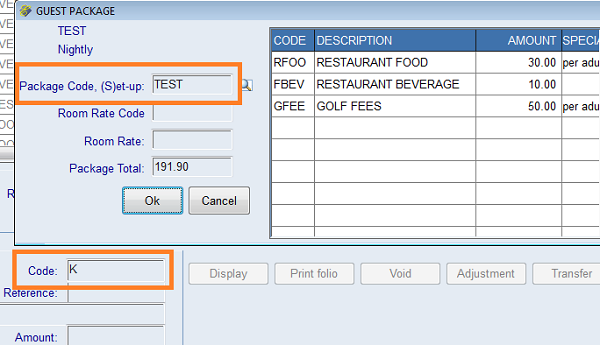 The above method will not work if you are not publishing the room rate with the package, as it will print on the folio.